Special Features: 90 minutes of special features including a variety of original trailers and featurettes that were used in theaters to promote the feature film, as well as footage from the film's Los Angeles and British premieres in 1964. Alan Jay Lerner and Frederick Loewe wrote a handful of memorable musicals, but 'My Fair Lady' remains undeniably their crowning achievement, and stands, along with 'Oklahoma!,' 'South Pacific,' and 'West Side Story,' as one of the most revered, revived, and quintessentially classic theatrical shows in history. Though most people remember the movie version of 'My Fair Lady' for its melodic score, captivating performances, witty script, and colorful sets and costumes, few realize George Cukor's Oscar-winning adaptation also stands as an awe-inspiring success story in the field of film preservation and restoration. Faded, scratched, and almost crumbling after years of neglect, 'My Fair Lady' presented a monumental challenge for Robert A. Harris and James C. Katz, who in the early 1990s undertook the arduous task of revitalizing the picture. 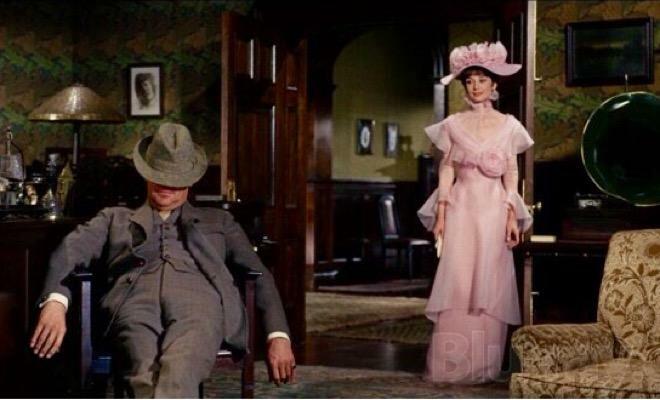 Film fans will forever appreciate their efforts (I still remember my open-jawed reaction when I first viewed the 2004 DVD), but unfortunately the first Blu-ray rendering of 'My Fair Lady,' released back in 2011, didn't do their work justice. More on that in our video review section below, but thankfully Harris returned to personally oversee this 50th anniversary restoration, which will knock the socks off of even the most jaded videophile. At last, all the impeccable artistry, lavish style, and beguiling sophistication of this beloved musical - which took home eight Academy Awards, including Best Picture - is on full display. And it's so luscious, you'll want to eat it with a spoon. Much has been written about the controversial hiring of Hepburn, a non-singing actress, for such a major musical. And although professional dubber Marni Nixon (who was also the voice double for Deborah Kerr in 'The King and I' and Natalie Wood in 'West Side Story') eventually would be hired to record 95 percent of her vocals, Hepburn still turns in a spirited, passionate performance worthy of Oscar recognition. More dimensional than Higgins, Eliza brims with complexities, and Hepburn boldly depicts her inner struggles, yet shades her portrayal with a fragility and tenderness that is, at times, heartbreaking. As is mentioned on the disc's commentary track, Andrews' Cockney accent might have bested Audrey's, but nobody can play a princess like Hepburn, whom many still regard as Hollywood's most regal and glamorous star. Harrison, of course, so embodies Higgins, it's tough to tell where the character ends and the actor begins. Relishing every nasty putdown and thunderous rant, Harrison romps through the film with an infectious energy and debonair style that make us somehow forget his character's cruel and exasperating nature. Like Eliza, we wind up embracing Higgins' faults and (almost) forgiving his shameless sexism. When he ultimately confesses 'I've Grown Accustomed to Her Face,' the admission resonates like shockwaves from an earthquake, and we think maybe he's not such a hopeless case after all. 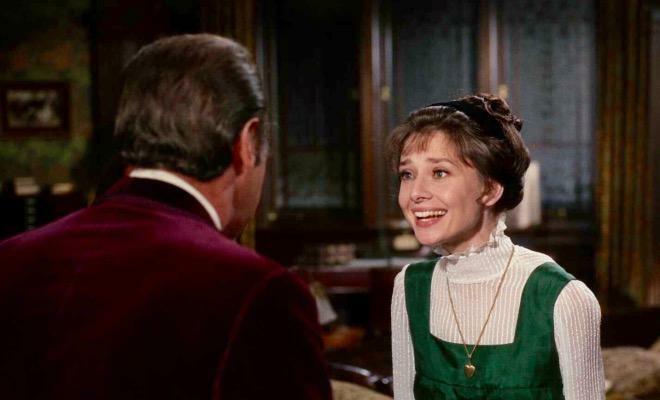 'My Fair Lady,' however, is so much more than Hepburn and Harrison. Cukor directs the feature in a Minnelli-esque fashion, with meticulous attention to color, set decoration, and costumes. (The eye-popping gowns and outrageous hats by Cecil Beaton adorn not just Hepburn but even the most insignificant extras, lending the production its inimitable sense of style and class.) Always a champion of actors, Cukor also extracts excellent portrayals from such seasoned veterans as Stanley Holloway, Gladys Cooper, Wilfrid Hyde-White, and Theodore Bikel. Pacing can drag at times — an extraneous subplot involving Eliza's father easily could have been excised if it didn't include two of Lerner and Loewe's best tunes — but, on the whole, he keeps things moving while maintaining a frothy, ethereal feel that perfectly complements the material. This is big-budget moviemaking at its opulent best, and every penny is well spent. Finally, what would 'My Fair Lady' be without its score? 'Wouldn't It Be Loverly?,' 'I Could Have Danced All Night,' 'On the Street Where You Live,' 'Get Me to the Church on Time,' 'Show Me,' 'Just You Wait,' 'With A Little Bit of Luck' — so many immortal songs in one show, and almost all advance the plot or delineate vital character traits. 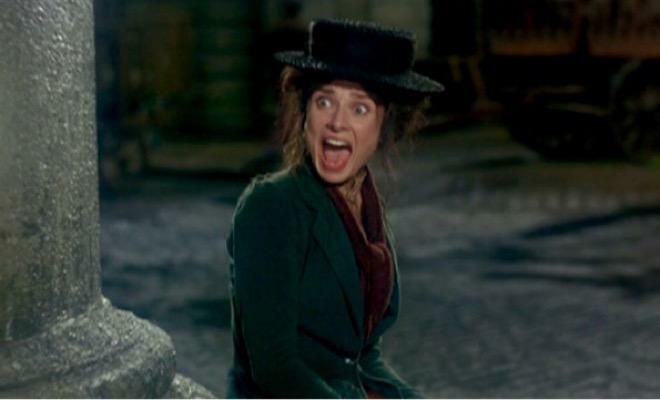 It doesn't matter a whit who sings them; they're part of our musical heritage, just as 'My Fair Lady' remains one of the last great musical achievements of 20th century cinema. And to think we almost lost it...twice. The 50th anniversary edition of 'My Fair Lady' arrives on Blu-ray packaged in a shiny metallic fold-out case that houses two BD-50 dual-layer discs (one contains the feature film, the other all the supplemental material) and a standard-def DVD. 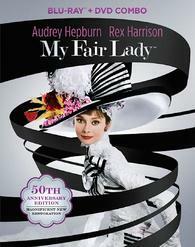 In my review of the previous Blu-ray release of 'My Fair Lady,' I complained about the packaging's lack of panache: "A film of this sort demands a more lavish presentation befitting its stature as both a classic piece of American musical theater and winner of eight Academy Awards, including Best Picture. Why not a digibook or a collector's edition with fancier packaging and a commemorative booklet?" Well, Paramount listened, Though there's no booklet included, the sleek, stylish case oozes glamour and sophistication, properly reflecting the movie's impecccable production design and the high technical quality of this release. Video codec is 1080p/AVC MPEG-4 and default audio is Dolby TrueHD 7.1. Once the disc is inserted into the player, the animated menu with music immediately pops up; no previews or promos precede it. 90 minutes of special features including a variety of original trailers and featurettes that were used in theaters to promote the feature film, as well as footage from the film's Los Angeles and British premieres in 1964. It's no secret Paramount's 2011 transfer of 'My Fair Lady,' while far from awful, was a huge disappointment to classics aficionados and those who revere this award-winning musical. Even the man who spearheaded the movie's stunning 1994 restoration, Robert A. Harris, railed against the release, advising consumers to steer clear of it. Yet out of something bad often comes something good, and thankfully, Harris convinced Paramount executives 'My Fair Lady' - due to continued deterioration - warranted another restoration, which he again personally oversaw. This time, the film has been remastered in 4k from an 8k scan of the original negative, as well as other surviving 65mm elements; the original 65mm aspect ratio of 2.20:1 has been restored (which lends the picture an intimacy the previous Blu-ray release lacked); and more than 12 million instances of dirt and damage have been removed and repaired. The result is an astoundingly gorgeous 1080p/AVC MPEG-4 transfer that makes this 50-year-old motion picture look like it was produced yesterday. Gone are all the faint white speckles that plagued the prior edition, gone are all the hazy, diffused edges that sporadically appeared in various scenes, and gone is the muted contrast that kept the image from truly popping off the screen. Though I hesitate to use such terms as "perfect" and "peerless," no other words accurately describe the quality of this transfer, at least as far as classic movies are concerned. Never have I seen such impeccable resolution, color timing, balance, and depth in a digital transfer of a film produced prior to 1970. All the elements work in sync to create a fluid image that's consistently filled with so much detail it's often difficult for the eye to concentrate on the principal actors during the initial viewing. The opening scene at Covent Garden, which has always been a bit problematic, has never looked better. The sequence is brighter and crisper than ever before, with heightened texture levels in the columns, more detail on Eliza's straw hat, and greater contrast on the glistening rain-soaked cobblestones. The rest of the film is equally impressive. Mirror images are razor sharp, as are the book spines in Higgins' library. The heavily patterned wallpaper jumps off the walls, background elements in high and low angle shots are crystal clear, and details in rugs, pillows, and costumes (such as the tweed weave in Higgins' jacket and the chiffon, lace, feathers, and furs that adorn the ladies' gowns) are beautifully rendered and perfectly stable. As they did in the previous release, the lush blacks, vibrant whites, and distinct grays that dominate the horse-racing scene at Ascot stand out well, as does Eliza's peach outfit during the 'Show Me' number. Faint grain preserves the film-like feel but never calls attention to itself, and close-ups, though sparingly employed, showcase fine facial details well. Sumptuous colors - from bold primaries to delicate pastels - flood every frame, maximizing the impact of Cecil Beaton's exceptional production design, and flesh tones always appear natural (although Harrison's perennial tan seems a little out of character for an erudite Englishman like Higgins). No defects, such as noise, crush, banding, or pixelation, are visible, and any digital enhancements have been judiciously applied so they blend seamlessly into the film's fabric. This transfer, along with the equally spectacular restored version of 'Spartacus,' sets the bar for classic movie digital presentations, and will be the new standard against which future releases will be measured. It will thrill casual viewers and persnickety videophiles alike, and deserves more than five stars. The major change here is a shift from DTS-HD Master Audio 7.1 to Dolby TrueHD 7.1. I wasn't expecting much of a difference, but I was surprised at the increased levels of nuance, the heightened clarity, and more noticeable separations the Dolby TrueHD track provided. Ambient effects are especially pleasing, as crowd noise, the rain in the opening sequence, and the joviality in the pubs sound more dimensional and enveloping. Tones remain bright and full, and though surround activity is largely limited to the musical numbers, there's some pronounced stereo separation up front that nicely widens the sound field. Dialogue is always clear, well prioritized, and easy to understand, but it's more directional than before, subtly shifting across the front speakers in sync with the characters' movements. The orchestrations sparkle, thanks to a wide dynamic range that handles all the highs and lows with ease, and the songs integrate well into the mix, with no drastic level shifts forcing us to fumble for the volume controls. The vocal timbres of the leads come through with gusto (making it easier to distinguish between Hepburn's own vocals and those of her voice double, Marni Nixon), and the individual voices in the choral numbers are more distinct and meticulously layered than ever before. 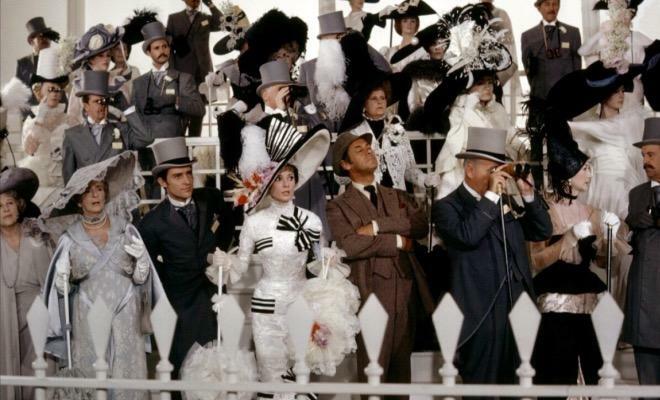 As was the case with the previous Blu-ray release, the track's only real stumbling block occurs during the Ascot horserace sequence, one of the film's high points. Twice, a pack of thoroughbreds gallop by, giving the subwoofer its only test. Though there's plenty of weight and room-shaking rumble to the event, the sequence is marred by some unfortunate distortion that diminishes the impact of Eliza's famous cheer of encouragement to one of the horses. But if that's the only hiccup in a 172-minute track, I can live with it! No other distortion creeps into the mix, and no age-related hiss, pops, or crackles intrude. This Dolby TrueHD track isn't just a winner, it's a champion, and provides the fullest and most satisfying audio experience this beloved Oscar-winning musical has ever enjoyed in the home video arena. Talk about a bounty big enough to flood the plains of Spain! All the extras from the 2011 Blu-ray, with the strange exception of the audio commentary (why get rid of that?) and original 1964 trailer, have been ported over to this 50th anniversary edition, and several new supplements have been included to sweeten the pot. The material is organized differently - a Rex Harrison radio interview is no longer buried in the galleries section and new visuals accompany it - to make everything a bit more user friendly. Vintage Newsreel Footage: "British Premiere" (HD, 2 minutes) - This gloriously restored color footage from the film's British premiere includes appearances by producer Jack L. Warner; production designer Cecil Beaton; actor Jeremy Brett; actor Rex Harrison arriving with Vivien Leigh; Audrey Hepburn on the arm of husband Mel Ferrer; and the event's hostess, England's Princess Alexandria. Production Tests (HD, 7 minutes) - Alex Hyde-White, son of Wilfred Hyde-White, who portrays Colonel Pickering in the film, describes a series of interesting production tests, fondly remembers his father, and recalls visiting the Warner Bros lot as a four-year-old. Included are an interior lighting test in Higgins' study, a makeup test of Wilfred Hyde-White, a rain test on the Covent Garden set, a light test on the Covent Garden set, and an alternate screen test featuring actor John Williams as Pickering and an unidentified performer as Higgins. Theatrical Trailers (HD, 11 minutes) - A whopping seven previews are included: a teaser trailer (with the option of inserting seven different U.S. cities into the teaser); a "With pride..." trailer that heralds Warner's delight in presenting 'My Fair Lady'; an Awards trailer that touts the multiple Oscars the film won; a theatrical reissue trailer featuring illustrations from the movie's poster art; a theatrical reissue trailer announcing special reserved seat engagements; a theatrical reissue trailer focusing on the film's cadre of awards; and a more straightforward (and lengthy) theatrical reissue preview that contains a number of scene clips. Vintage Featurette: "The Story of a Lady" (HD, 5 minutes) - This promotional short focuses on the success of the Broadway production, the record sum paid by Warner Bros for the film rights, casting, and the meticulous construction of the opulent sets and costumes that grace the movie. Lots of behind-the-scenes footage - all of it in color - adds luster to this slick featurette. Vintage Featurette: "Design for a Lady" (HD, 8 minutes) - A companion to the previous promotional short, this piece looks at the research that goes into the film's design and allows the artistic director, Cecil Beaton, the chance to cite the tremendous attention to detail and authenticity that permeates every aspect of production, with particular attention paid to the Ascot racing scene and the outlandish hats that make such a stylish statement in the picture. Rex Harrison BFI Honor (HD, 2 minutes) - On the set of 'My Fair Lady,' Harrison awkwardly thanks the British Film Institute for recognizing him, then introduces a series of his films that will be shown to audiences in his honor. Documentary: "More Loverly Than Ever: 'My Fair Lady' Then and Now" (SD, 58 minutes) – This marvelous documentary chronicles the musical's evolution, transition from stage to screen, and meticulous restoration. Originally included on the film's 1994 VHS release and narrated by co-star Jeremy Brett, the in-depth examination seamlessly shifts between the history of the musical, production anecdotes, and the complicated technical process of rejuvenating 'My Fair Lady.' Before-and-after examples show the film's previous wretched state and wondrous makeover, proving once again the vital, urgent nature of film preservation and restoration. The documentary drops in plenty of interesting tidbits, such as Rex Harrison's refusal to lip-sync to a recorded vocal track (he sang live instead), and how Audrey Hepburn performed to her own (ultimately unused) vocals, creating quite a dubbing challenge for Marni Nixon. We also learn about a breakdown of relations between director George Cukor and designer Cecil Beaton, and hear Julie Andrews' views on losing the role she created on Broadway. Vintage Behind-the-Scenes Footage: "1963 Production Kick-off Dinner" (SD, 23 minutes) - After some silent clips of the dinner itself, interviews with Hepburn, Harrison, and studio chief Jack Warner follow, as well as excerpts from a press conference. A radiant Hepburn discusses how she trusts her artistic instincts when choosing a role, while Harrison charmingly (if testily) defends what the interviewer cites as his "difficult behavior" on the set of the then-forthcoming 'Cleopatra.' Both actors (as well as Warner) talk about the differences between making movies in Europe and Hollywood (a hot-button issue at the time), and how finances and schedules are easier to monitor and control in California. Some of the black-and-white footage is a bit scratchy and rough, some is out of sync at times, but it's a great historical document of a transitional period in Hollywood history. Vintage Audio: "George Cukor Directs Baroness Bina Rothschild" (3 minutes) - A number of color stills of Cukor directing various portions of the film run simultaneously with an audio clip of him working with Rothschild on the delivery of a single line. The rare excerpt provides a taste of Cukor's inimitable style. Vintage Featurette: "The Fairest Fair Lady" (SD, 10 minutes) - This entertaining studio-produced short hypes the film while examining various stages of its production, paying special attention to the extras and their grueling makeup and costume routine (an entire Warner soundstage was reserved for this assembly-line procedure). Glimpses of the editor, cinematographer, and various members of the technical crew at work are also included. Vintage Newsreel Footage: "Los Angeles Premiere 10/28/1964" (SD, 5 minutes) - Newsreel cameras captured the glitz and glamour of the film's Los Angeles premiere, documenting the arrival of an impressive array of stars, including Rock Hudson, Maureen O'Hara, Angie Dickinson, Frank Sinatra and Natalie Wood (who came as a couple), Dean Martin, Steve McQueen, Lucille Ball, Fred MacMurray, Donna Reed, and James Stewart. Vintage Footage: "Rex Harrison Golden Globe Acceptance Speech" (SD, 1 minute) - A pre-recorded thank-you speech by the actor, who was unable to attend the ceremony due to film commitments in Europe. Vintage Footage: "Academy Awards Ceremony Highlights 4/5/1965" (SD, 30 seconds) - A brief clip of studio chief Jack Warner accepting the Best Picture Oscar at the 37th Annual Academy Awards. Alternate Audrey Hepburn Vocals (HD, 7 minutes) - One of the most intriguing extras on the disc are full-length versions of the musical numbers 'Wouldn't It Be Loverly?' and 'Show Me' with Audrey Hepburn's original vocal tracks inserted. Watching Hepburn perform to her own vocals definitely validates the decision to dub her. While far from "bad," Hepburn's tracks reveal an untrained voice with lots of character, but without the range and power necessary for Lerner and Loewe's score. High notes are quite thin and shaky, while Hepburn's overall style is too similar to Harrison's for comfort. Galleries (HD) - Divided into four sections, these galleries include nine beautiful color sketches, 70 black-and-white production stills (mostly costume tests), 52 color production stills, and 40 documents and publicity artifacts, including clippings, media photos, and album and video covers. Rex Harrison Radio Interview (HD, 1 minute) - This brief radio interview, in which Harrison praises the production and his leading lady, is accompanied by color production and publicity photos. "Comments on a Lady" (SD, 2 minutes) - These are interview outtakes with director Martin Scorsese and composer Andrew Lloyd Webber from the "More Loverly Than Ever" documentary. Scorsese discusses film preservation and the establishment of the Film Foundation, while Webber recalls how illness forced Alan Jay Lerner to withdraw from their impending collaboration on 'The Phantom of the Opera' — one of the great disappointments of Webber's career. Both clips run just over a minute. Good things don't always come to those who wait, but in the case of 'My Fair Lady,' the old adage rings true. After a four-year wait, we finally have the Blu-ray transfer of this classic musical that we've always deserved, thanks to a painstaking restoration that has yielded a razor-sharp, sumptuously colored image that's as close to perfection as anything I have seen. As the packaging proclaims, 'My Fair Lady' is indeed "more loverly than ever" and one of the fairest jewels in the Blu-ray classics catalogue. As a film, this beloved tale of transformation remains a charmer, and its impeccable performances, first-class score, and opulent design make it a treat for the eyes, ears, and soul. Superb video and audio, an entire disc of supplements, and appropriately classy packaging make this Best Picture winner one of this year's undisputed Blu-ray highlights and a definite must own release.